We’d love your help. Let us know what’s wrong with this preview of How to Be Sick by Toni Bernhard. This life-affirming, instructive, and thoroughly inspiring book is a must-read for anyone who is--or who might one day be--sick. And it can also be the perfect gift of guidance, encouragement, and uplifting inspiration to family, friends, and loved ones struggling with the many terrifying or disheartening life changes that come so close on the heels of a diagnosis of a chr This life-affirming, instructive, and thoroughly inspiring book is a must-read for anyone who is--or who might one day be--sick. And it can also be the perfect gift of guidance, encouragement, and uplifting inspiration to family, friends, and loved ones struggling with the many terrifying or disheartening life changes that come so close on the heels of a diagnosis of a chronic condition or even a life-threatening illness. The author, who became ill while a university law professor in the prime of her career, tells the reader how she got sick and, to her and her partner's bewilderment, stayed that way. Toni had been a longtime meditator, going on long meditation retreats and spending many hours rigorously practicing, but soon discovered that she simply could no longer engage in those difficult and taxing forms. She had to learn ways to make "being sick" the heart of her spiritual practice and, through truly learning how to be sick, she learned how, even with many physical and energetic limitations, to live a life of equanimity, compassion, and joy. Whether we ourselves are sick now or not, we can learn these vital arts of living well from How to Be Sick. To ask other readers questions about How to Be Sick, please sign up. Hi Pegg, it's Michelle, is this any good for 25 M.E. thanks? I have lived with chronic illness for the past 27 years and I have read lots of books about how to life a healthy life with an unhealthy body. This book would now be my top recommendation for anyone who has a chronic illness or who cares for someone who does. Author Toni Bernhard has Chronic Fatigue Syndrome (as do I) and she doesn't sugarcoat how severe an illness this is. Her life was turned upside down, but she shares in this book the spiritual practices she uses to live her life as fully as I have lived with chronic illness for the past 27 years and I have read lots of books about how to life a healthy life with an unhealthy body. This book would now be my top recommendation for anyone who has a chronic illness or who cares for someone who does. Author Toni Bernhard has Chronic Fatigue Syndrome (as do I) and she doesn't sugarcoat how severe an illness this is. Her life was turned upside down, but she shares in this book the spiritual practices she uses to live her life as fully as possible. The techniques she explains come from Buddhism, but they can be used by anyone. I am a mainstream Protestant - no problem! These techniques do not cure illness, but they can change the way that one thinks about illness, eliminating the thought-patterns and attitudes that stand in the way of living a spiritually healthy life even with physical limitations. There is even a guide at the end of the book that reviews and summarizes the practices she presents in the text. I have been told you don't have to know how to meditate or even be attracted to Buddhist beliefs, to be helped by this book. Anyone with a chronic illnes or who cares for another with a chronic illness should consider this book. This is a book for those people who have an illness that is not going to go away. I am very reluctant to read self-help books. I just get out a piece of paper and pen and think while I jot down my thoughts. A dear friend suggested this to me. She said read a bit and see I have been told you don't have to know how to meditate or even be attracted to Buddhist beliefs, to be helped by this book. Anyone with a chronic illnes or who cares for another with a chronic illness should consider this book. This is a book for those people who have an illness that is not going to go away. I am very reluctant to read self-help books. I just get out a piece of paper and pen and think while I jot down my thoughts. A dear friend suggested this to me. She said read a bit and see what you think. That is what I did. It drew me in, and I wanted to continue. So this is what I am reading. This book is the first that has shown me the value of Buddhist beliefs. I had always seen Buddhism as excessively negative. Unfortunately the prime focus of Buddhism is that life is filled with suffering. Buddhism also says that suffering can come to an end. Perhaps just momentarily, but there are numerous ways to end suffering if we just know how. And this book shows how. The book, in a very simple manner, explains Buddhist thoughts, but more importantly, it shows you how to achieve peace. How to stop yourself from worrying all the time. How to lessen stress. These are phenomena that everyone encounters daily. The book is aimed at those who are chronically ill, because such people simply worry so much they feel they are about to drown, but absolutely anyone will benefit from this book. I have instinctively disliked the thought that desire was bad. Buddhism stresses that it is our desire that makes us suffer. In reality it is when we desire what we cannot achieve that desire becomes negative. Let me just say that this book explains this so much better than I can. No other book I have ever read about Buddhism has made it all so simple and clear. And it is not negative at all. And you smile when you read the book. Buddhists make list and number everything: Four Noble Truths and the Eight Fold Path to Freedom/Liberation and the Three Marks of Existence. The Buddhists can count..... It does make you smile! What is best about thi book, forget all the other stuff you intellectually learn, is that it shows you how to enjoy life more. Listen to what I am saying! Is that a negative message? Indeed it is not! There is nothing negative at all about the Buddhist teachings. The book is filled with ideas of how you can get more out of life when you are worried and stressed and upset. You do not need to be chronically ill to get a lot from this book. If you are chronically ill, it is a life-ring that helps keep you afloat. It is however up to you to take the routines described in the book and use them. The book is so simple. Through practices/routines it shows you what you can do. I will give you one example, that is found in this book. Close your eyes and think of something in your past that makes you unhappy, perhaps an event where you wish you had behaved differently. Pick something that troubles you in your past. Then open your eyes and look ilmmediately at your cat, or your garden, or your dog or whatever you do love. Something that makes you spontaneously happy! Don't you just feel the worry drop off you? You "dropped it", that worry. If you practice this in other situations you will learn and teach your body how to "drop it" on command. This book is filled with little things that you can do. Some worked for me. Others didn't. Some I simply didn't know what they were talking about, but I am just at the beginning. This is a little book to practice with. OK, maybe borrow it from the library the first time you read it, but if you do not have it at home you will forget what to do. This book is written in such a way that you will understand what you must practice. YOU do them as much as YOU need them. You choose those routines that work for you. This book refers to many other Zen and Buddhist books. The author gives examples that another particular book/author suggests. In this way you know which books maybe you want to try next. For me there is so much in this little book that I need nothing more, not yet at least. The magic of this book is that theses teeny exercises worked immediatley. She has a knack for explaining them. She is herself chronically ill. She has had to use these routines. She know what works and doesn't work. I think that is why she explains the routines so well. And the routines have fun little names so they are easy to remember. I have had diabetes for 50 years. That is a long time. In the last year I have had increasing problems with my vision. This has really messed up my emotions. This book was a life-ring thrown to me. It is not going to improve my diabetes or my vision, but it will help lighten the emotional burden. Many of the ideas presented were in fact not new, but the book somehow has made these philosophical beliefs that I have always held a means by which I can fight worry and stress and fear. I was unsure about this book initially because of its title. I found myself thinking " I don't want to know how to be sick, I want to figure out how to get well." However, after reading it, the only thing I did not care for about the entire book was its title and it has even grown on me. The book is Buddhist inspired. I found great help from it in spite of having essentially no knowledge about Buddhism. I plan on looking up some of the references to learn more, in fact. Reading this book if you I was unsure about this book initially because of its title. I found myself thinking " I don't want to know how to be sick, I want to figure out how to get well." However, after reading it, the only thing I did not care for about the entire book was its title and it has even grown on me. The book is Buddhist inspired. I found great help from it in spite of having essentially no knowledge about Buddhism. I plan on looking up some of the references to learn more, in fact. Reading this book if you are chronically ill is like opening a treasured box of chocolates. Each one has a new flavor and builds on the experience of the entire box. The book is packed with pearls about dealing with chronic illness which also build upon themselves and lace the entire book with flavor of life and living in spite of the suffering that comes with chronic illness. At times I even cried, which is rare for me, because I identify with the journey of the author and her stories. Toni reminds us that all people suffer and she frankly discusses the issues that come up with doctors, friends, family and self while dealing with chronic illness and then presents some solutions for not allowing those issues add to our suffering. There is a summary key in the back which also lists specific issues and practices which can be helpful when the issues come up. I felt like a dear friend was writing to me and I could completely relate with the mirror stories that have happened in my own life and even mirror lessons.......though I am not Buddhist. "It’s easy to look back and see what a mistake it was to continue working while sick—it probably worsened my condition—but many people who have contracted a chronic illness have done the same. First, there’s the financial need to keep working. Second, there’s the utter disbelief that this is happening to you (reinforced by people telling you that you look just fine—people who don’t see you collapse on the bed as soon as you get home)"
"Part of the reality of chronic debilitating illness is contin "It’s easy to look back and see what a mistake it was to continue working while sick—it probably worsened my condition—but many people who have contracted a chronic illness have done the same. First, there’s the financial need to keep working. Second, there’s the utter disbelief that this is happening to you (reinforced by people telling you that you look just fine—people who don’t see you collapse on the bed as soon as you get home)"
"Part of the reality of chronic debilitating illness is continually trying to figure out why you are so sick—and never getting a definitive answer." "Ironically, people may think you’re giving up, when in fact you are simply giving in to the reality of your new life." Now, on a day when I start to sink into that "Why me?" mood, I turn it into "Why not me?" I, too, have health insurance. I, too, did not suffer financially when I had to stop working, other than having to tighten out budget. I, too, have the best of caregivers. I had high hopes going into this, and that is perhaps my fault, but this is more of the same from the same people who have been talking about CFS the most publicly since forever and makes me feel even more isolated than when I started reading this. Despite all the "Buddhist-inspired wisdom" of this book, I feel like the takeaway is that, if you already lived a fulfilling life and had a career and a family before getting sick, if you have financially security and a lot of other resources at your disposal, your life might not be unrecoverably horrible, but, if not, there's not a whole lot out there for you. As such, I'll take away a few good ideas from this, but am left wanting in the how and why of a lot of the things involved in living a sometimes okay life, which is really all Bernhard is selling as the result of guide. I did find that Bernhard's descriptions of what it's like to live with Chronic Fatigue Syndrome accurate, and reading something by someone with CFS is something I didn't realize I was as starved for as I was. It's definitely a (too) diverse syndrome that presents itself pretty differently, but she touched upon more or less all of the universal symptoms in a way that was both accurate and expressive. She also mentioned pretty much all the other things that come along with such a devastating illness, and how it impacts those around the one who is ill. So for that, and for what she wanted this book to be, I give it 2 1/2-3 stars. But really, I am kind of more bummed out about my life than I was before I read it, which, ouch, is not great. This is probably the most important book I've ever read. For anyone who has a chronic illness, or takes care of someone who has a chronic illness, I can't imagine a better book. I keep it near me often & have it both on my Kindle and in print form so that I can mark the passages that resonate with me. William has read parts of the book also and found that it not only affirms things we have both known (but sometimes forget when my flare-ups are at their worst) as well as new ways to cope and This is probably the most important book I've ever read. For anyone who has a chronic illness, or takes care of someone who has a chronic illness, I can't imagine a better book. I keep it near me often & have it both on my Kindle and in print form so that I can mark the passages that resonate with me. William has read parts of the book also and found that it not only affirms things we have both known (but sometimes forget when my flare-ups are at their worst) as well as new ways to cope and look at the world. It especially helped me this holiday season when I was not able to be part of several parties w/friends & family. Even though neither of us are "religious", This Buddhist inpired book, along w/the wonderful computer/ipod/etc friendly yoga & meditations that I buy on my yoga teachers web-site, www.yeslifecoachcompanion.com have made terrible days, in tollerable days. An important book for anyone with chronic illness, but unfortunately not quite as applicable to me as I had hoped. I’m very new to Buddhism and wish to pursue it further. Most of this book has given names to practices I already implement to help me cope with chronic illness. Practices which have naturally evolved with time as I have come to terms with my new life. I guess I’m naturally inclined to Buddhist thinking! It has reinforced their importance though, which is good, and it’s given me new things to try and to develop further. I should probably have read this sooner when I was less able to cope with my i I’m very new to Buddhism and wish to pursue it further. This is one of the first books I've read in regards to chronic illness. It is AMAZING. It's refreshing to see someone being so honest about being sick, acknowledging how awful it is and sharing ways to make life a little easier. Highly recommended for any spoonies out there. A good read for anyone with a chronic illness. Toni's chronic illness is much more severe than mine, but any Chronic Illness is a mentally heavy weight to carry and this book offers some great techniques for handling the load. I've been living with chronic illness my entire life: I was born with a genetic immune deficiency which has worsened with age. Along with the immune deficiency, I have several other auto-immune conditions as well as a chronic pain syndrome. To look at me, you'd never know how sick I am: I look perfectly fine on the outside. People like me are said to have "invisible illnesses." We are often misunderstood by family members, friends, even health professionals (for those of us with rare conditions, I've been living with chronic illness my entire life: I was born with a genetic immune deficiency which has worsened with age. Along with the immune deficiency, I have several other auto-immune conditions as well as a chronic pain syndrome. To look at me, you'd never know how sick I am: I look perfectly fine on the outside. People like me are said to have "invisible illnesses." We are often misunderstood by family members, friends, even health professionals (for those of us with rare conditions, like me). Trying to live a full and happy life despite my health challenges is my greatest struggle. It's even more profound now that I'm a mother: I don't want my daughter to see me as a sick person. I want to be the best that I can be for her, and have the most positive outlook possible. So it was with excitement that I read Toni Bernhard's How to Be Sick. I read an article written by Toni online and loved her writing style and message. I immediately bought her book and I simply devoured it. This book spoke to me and affected me deeply. I am a Christian and was a little leery of the fact that this book is Buddhist-inspired. I didn't know what that meant, really. All I knew about Buddhism is that practitioners meditate. That was it! 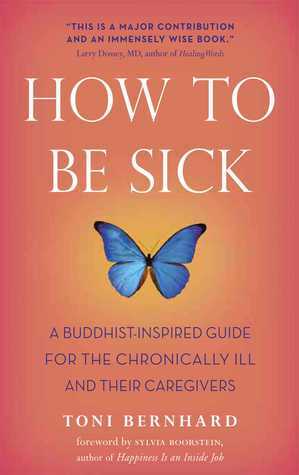 Toni gently educates the reader by applying Buddhism's principles to how to live peacefully with chronic illness. The main concept of this book is how to alleviate the mental suffering that accompanies chronic illness. Common examples of mental suffering are: asking why is this happening to me, being envious of healthy people, and being uncertain about the future (when will I relapse, will this treatment work, fear of testing and doctor visits, and fear of being unable to attend family events, etc). These issues are all things I struggle with in my every day life. So, to read a book that teaches me specific ways to address these fears was a true gift. I loved that Toni gives so many practical examples throughout the book. The examples really drove the points home and made me feel like I could start applying what I learned right away. There is a great section at the end of the book with bullet points of what to do in certain situations. I loved that! The only reason I didn't give this book five stars is that is specialized. Hopefully you will never fall into the category of people living with a chronic illness, because that stinks. If you have, this is a must buy. She writes with much grace about the psychological and spiritual changes that she made in order to deal with her case of chronic fatigue and immune dysfunction syndrome. She uses Buddhist terminology to describe her path from anger to acceptance and from isolation to solitude. Life The only reason I didn't give this book five stars is that is specialized. Hopefully you will never fall into the category of people living with a chronic illness, because that stinks. If you have, this is a must buy. She writes with much grace about the psychological and spiritual changes that she made in order to deal with her case of chronic fatigue and immune dysfunction syndrome. She uses Buddhist terminology to describe her path from anger to acceptance and from isolation to solitude. I started to read this then decided to stop and start again when I could dedicate more time to make highlights in the book. I absolutely LOVED this book! This is now going to be my illness bible. :) I have a lot of health issues as well so I felt connected to the author. But being someone with no chronic illnesses? I'm not sure if they would like it less or not. The author makes great points and uses plenty of examples (yay!). Most of the skills she lists in the book I have already learned from I started to read this then decided to stop and start again when I could dedicate more time to make highlights in the book. I absolutely LOVED this book! This is now going to be my illness bible. :) I have a lot of health issues as well so I felt connected to the author. But being someone with no chronic illnesses? I'm not sure if they would like it less or not. I'd wholeheartedly recommend this to anyone dealing with chronic illness, but especially those with Chronic Fatigue Syndrome/ME, lupus, fibromyalgia, Lyme disease, or any other complex condition that is not easily treated. I'm glad I finally read it, and it's one I'll be referring to every time I need a little extra help. My partner is quite impaired by a chronic condition about which the medical community knows little. The whole situation creates problems I really wouldn't have understood if I was simply watching a friend go through it. Do we try and talk about his condition to friends, to help them understand what's going on? Or do we keep our mouths shut because, let's face it, listening to people talk about their health problems is deadly boring (and if we had a choice, we would prefer to talk about something My partner is quite impaired by a chronic condition about which the medical community knows little. The whole situation creates problems I really wouldn't have understood if I was simply watching a friend go through it. Do we try and talk about his condition to friends, to help them understand what's going on? Or do we keep our mouths shut because, let's face it, listening to people talk about their health problems is deadly boring (and if we had a choice, we would prefer to talk about something else)? Do we try and make social plans when we know 3 out of 4 times, my partner will have to cancel on them? But then again, that fourth time he has a great deal of fun. Do we try every hare-brained remedy that comes up on the internet (magnets! earth-friendly detergent! cultivating your gut flora!) in the hopes that something will help him, or do we try and adjust our lives to his present impairment and avoid the soul-crushing exhaustion that comes from chasing after every tiny promise of a cure? How do we tactfully decline medical advice from well-meaning friends who don't have the slightest idea what they are talking about? This isn't a book with answers to any of those things at all. Instead it's a book that takes as its premise a reader in an irreducibly difficult situation. It then tries to communicate some ways that such a reader might cultivate compassion toward himself and toward the world around him, even when his difficulties can't be solved or magically dispersed. And I'd say for that reason, it's honest and it works. The author sticks closely to talking about herself, her own situation, reactions, and complicated feelings. This has the drawback (as other reviewers have pointed out) of perhaps making readers in more complicated situations (those with less money, those with small children) feel a bit alienated. At the same time, it keeps her from falling into the trap of simply telling people what to do. She says several times: this is what works for me. Maybe you can adapt some of it to your situation, but don't push what doesn't work. The writing style is VERY clear and the bulk of the book is anecdotal, so it would not be hard for people with brain fog to follow a little bit at a time. And I can't get away from the feeling that this is a very, very, very smart book. HOWEVER -- this might also not be a book for everyone grappling with a chronic illness. There were times when simply reading about her experiences of isolation and fatigue made me feel very hopeless about our own situation. She places the emphasis of the book on dealing with one's current situation, which may feel very disheartening to people who are still actively trying to seek a cure for themselves. There isn't anything in the book that advises ill people NOT to seek cures -- it's just that the book's main focus may not reflect the "we are going to overcome this no matter what" mindset you might have about your illness right now. Plenty to say about this. Just not sure I can do it tactfully. A good book for some people, especially when you are bogged down with despair and don't know how to get out. It does give some good strategies for beginners of the whole "you choose your emotions" school of thought or Buddhist concepts in general (of which I'm a beginner, myself). But it might not be so helpful for those who are determined to heal and aren't really interested in fulfilling others' needs to have their suffering storie Plenty to say about this. Just not sure I can do it tactfully. A good book for some people, especially when you are bogged down with despair and don't know how to get out. It does give some good strategies for beginners of the whole "you choose your emotions" school of thought or Buddhist concepts in general (of which I'm a beginner, myself). But it might not be so helpful for those who are determined to heal and aren't really interested in fulfilling others' needs to have their suffering stories heard. I know it's a valid need for a certain stage in the "grieving" etc. process of the trauma of losing one's health, but I'd like to see people separate their memoirs a little better from their so-called self-help guides. * After a point, we need to put aside all the indulgences in our suffering and get down to the business of healing (two words: Gupta Programme). I also can't give any book more than 2 stars if it perpetuates the myth that Chronic Fatigue Syndrome is a permanent condition. And yet another criticism (acknowledging that no one book can please everyone and the author's privileged circumstances are not a "fault,") is that if you're not upper-middle to upper class; you don't have a spouse to support you; you are young and haven't had a fulfilling career and/or children/family of your own; you have the strain of caring for young children while ill; you are battling homelessness, lack of essential needs, lack of access to medical care, and family desertion; or your CFS has progressed to severe MCS; you'll probably hear yourself saying, "Quit your whining!" multiple times while reading this book. But then the lesson there is that it's all relative, an we can look to others who are worse off than us--at any given moment--as role models and evidence that we can survive and overcome more than we ever imagined we could. All that aside, after experiencing the excessive negativity and lack of introspection amongst people with environmental illness (fibromyalgia, chronic fatigue syndrome/ME, multiple chemical sensitivity, etc.) in online support groups, I would say that MOST people with those conditions (and many people with other conditions or NO physical conditions) would benefit from this book. As far as its use for other people, I might give it more like 4 stars. The 2 stars are just illustrating how it fits in with where I am in my journey. This book is an absolute treasure that I would recommend to any human, sick or well. For the sick this book has a lot to offer in way of practical methods, hopeful encouragement and consolation - you are not the only one - and for the healthy of body and mind this book can help you appreciate your health, use it more efficiently and you, too, can use the many methods in this book to overcome suffering (dukkha) in your own life. Bitterness, frustration, anger, resentment, hatred, self-pity, shame This book is an absolute treasure that I would recommend to any human, sick or well. For the sick this book has a lot to offer in way of practical methods, hopeful encouragement and consolation - you are not the only one - and for the healthy of body and mind this book can help you appreciate your health, use it more efficiently and you, too, can use the many methods in this book to overcome suffering (dukkha) in your own life. Bitterness, frustration, anger, resentment, hatred, self-pity, shame and self-blame are terrible emotions to harbor. The person hurt most by them is the person holding them and this book can nudge you in the direction of letting go a little, and when you experience relief, maybe you can let go a lot. Shouting at the person who cut you off in traffic? You're suffering. Snapping at your parent, child, partner og roommate for doing something annoying? You're suffering. Getting stressed about a mile-long to-do list that you can never finish? You're suffering. Laying in bed all day, sick and without the means to get out and enjoy life like your peers? Suffering. And this book has a lot to say about suffering and how to diminish it. A truly inspiring book. Though I'm not a Buddhist, I found the coping practices discussed to be very helpful. This book was a true eye-opener in that it made me rethink my approach to being chronically ill and my way of thinking in regards to the drastic life changes that were the result of my illnesses. I would highly recommend this book to anybody who is, knows somebody who is, or is a caretaker of someone who is chronically ill. I have been following Toni Bernard's column How To Turn Straw Into Gold for years and her Buddhist-Inspired Guides have been on my reading list for what seems like forever. As the years went by and I got sicker, I started getting angrier and angrier at how my body has betrayed me in so many ways. It finally culminated a week ago when I had to call my family in Canada to say that I was too sick to come home to Canada for my sister's wedding. The 24+ hour journey would mean stepping off that plane I have been following Toni Bernard's column How To Turn Straw Into Gold for years and her Buddhist-Inspired Guides have been on my reading list for what seems like forever. As the years went by and I got sicker, I started getting angrier and angrier at how my body has betrayed me in so many ways. It finally culminated a week ago when I had to call my family in Canada to say that I was too sick to come home to Canada for my sister's wedding. The 24+ hour journey would mean stepping off that plane sicker than I've been all year and spending my whole summer vacation in bed, unable to participate in a celebration of love and happiness. We missed our wedding anniversary, Christmas, New Year's Eve, my birthday and many other celebrations in order to be home this summer, and I was filled with so much rage and sorrow and grief after telling my sister I wasn't coming, I turned to this book for solace: Toni Bernard's How to Be Sick: A Buddhist-Inspired Guide for the Chronically Ill and Their Caregivers . I wondered if she might have some words of advice for me. This book is full of hope and guidance; it offers encouragement and has provided inspiration to me, and I have also recommended that my family reads it and I've recommended it to my friends that are chronically ill as well. There are many wonderful take-aways from this book, but most assuring was realizing I'm not alone and that I'm not the only person who has missed family events like weddings and birthday parties because I am too sick to go to these kinds of things any more. Chronic illness is a very different beast to acute illness or terminal illness. There is an end stage with the two latter types of illnesses I mentioned. You either get better or you don't. It's a hard road, but it's a road that you can see the light at the end of the tunnel with. Chronic illness and pain are different because there is no light at the end of the tunnel. You never get better. You subject yourself to ridiculous treatments and do ridiculous things to try and keep living your life normally until you finally realize you don't know what normal is - or you know what normal is - it just isn't everyone else's idea of normal. You can't imagine a life of unending fatigue, pain and illness until you've experienced it, and I hope you never do. You certainly can't compare the pain of breaking a leg to the pain that we experience when it is chronic NEVER-ENDING pain with no cure. The suicide rate amongst those of us with chronic pain and chronic illness is high for a reason. We have so many lows and highs in our lives, when we hit those rock bottom lows and we're in so much pain we can't even think straight, of course all we can think about is putting an end to things. There are days when I wonder what the point of my own existence is. I have a feeling I know what it is, but I need more time - that of which I have plenty of! The author became ill as a university law professor at the height of her career. A long-time mediator, Toni was already a student of Buddhism and she spent many hours in Buddhist retreats until she realized her illness wouldn't even allow her to practice her religion properly. Instead, she turned her focus elsewhere and learned how to make 'being sick' the heartbeat of her spiritual practice. Despite her severe physical limitations, she learned how to live a life of joy and compassion. Bernard has Chronic Fatigue Syndrome, the same as me, although I have other nasty chronic illnesses that led to this particular diagnosis, and I've added on more since I received my CFS diagnosis. Everything started going downhill with my Ankylosing Spondylitis diagnosis in 2009. I have lived with chronic illness for over 20 years and I have been in severe chronic pain since 2007. I laughed at my doctor when he said life was going to get hard and when I found myself putting hand over hand on a stairway railing, literally pulling my body up a flight of stairs as it seemed encased in cement, it dawned on me that he was right all along. And then there was Toni, recounting her own struggle with stairs in this book. I felt some validation and a little sigh of relief. I am not the only one. I am not crazy. Bernard doesn't try to cover up how severe her illness is. These kinds of illnesses turn your life on end and you're never the same again. I have fought my diseases day after day, year after year for many years. I continued working when I knew deep in my heart years ago (May 2015 to be exact) that I must stop, and this year will be my last year trying to make things work from a traditional work environment. It was gratifying to hear of someone else's comments on being housebound, on missing out, on losing your old life and having no choice but to accept your new life. I have raged against my body for years and this year, I hit a turning point: acceptance. I'm not going to get better, but what I can do is make my life more manageable and if that means avoiding certain situations to maintain and experience less pain, then so be it. I might not be Buddhist, but I do like the spiritual practices she uses in her life to live her life as best as she can. Bernard teaches us how we think about our illness and she puts a strong emphasis on practicing joy, kindness, and compassion towards ourselves and towards others. She also shows us that we can have a healthy spirit in a body that continues to fail us. I have a feeling this book will remain on the shelf next to my bed so I can refer back to it from time to time. It's very easy for me to look back and see the mistakes I made while trying to work through my illness, but the facts never changed and my pain journals prove it, I continued to work and try to push through things when my body was telling my to rest, and that ultimately led to me being sicker. I can also see how difficult it must be for people who have looked at me in utter disbelief when I tell them I am sick, because I look fine. You'd never guess there's anything wrong with me except for how I hold my upper body, (I cradle it because I don't have the strength to keep my shoulders back or my arms hanging freely), or how I wobble when I walk. Those same people who think I look fine don't see me collapse into bed at the end of the day. They also don't know that when they're out having fun on weekends, I'm in bed looking out my window as the sun shines in, coloring away, reading, watching tv, playing with my cat and wishing I were anywhere else but where I am at that moment. It is a maddening and constant search to find out why I am so sick without ever getting a real answer, and that is also my reality. Being sick is my reality and that's never going to change, so I might as well change how I look at my illness and my new life. And so, thank you, Ms. Bernard, for showing me the way. I think I was already on this path, but you have made the path so much clearer for me, and I am grateful for your advice and for your books. I would definitely recommend this book to anyone who is chronically ill. Picked this up after enjoying the author's blog on Psychology Today. Toni Bernhard is a former law professor who caught a flu-like disease on a trip to Paris and that illness never went away. Not only is she chronically ill with an invisible illness, that illness is unclassifiable, most closely resembling chronic fatigue syndrome. I should stop and define those terms. Invisible illnesses are those that you can't immediately see when looking at a person. Such conditions tend to attract the "you're Picked this up after enjoying the author's blog on Psychology Today. I should stop and define those terms. Invisible illnesses are those that you can't immediately see when looking at a person. Such conditions tend to attract the "you're not really sick" reaction. And by unclassifiable illnesses, I mean illnesses that stump multiple specialists. To compare, I'm currently disabled, officially since November 2008, unofficially I've had declining health for some time now. One of my conditions -- I won't describe them all -- was just diagnosed last October (2012) and is currently being treated. But I have had the condition in some form for at least a decade. I don't think I had anywhere near as many specialists baffled as Toni did, but I certainly empathize. 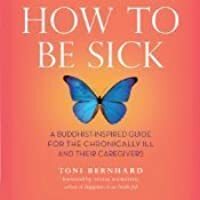 Beyond Toni's personal story, the book contains accessible Buddhist teachings and practices with an eye to those who are chronically ill, as well as their caregivers. I enjoyed reading about Toni's personal story. It's a great relief to find someone who understand feelings that are hard to share with those who aren't fighting a chronic condition, no matter how much those individuals love us. For example, do you ask for help when you could probably do something for yourself, at perhaps a great cost, or do you save up the "favors" for things you really can't handle? For me, I have reduced mobility, so I often find myself questioning if I should fight the stairs or ask someone else to grab whatever I need from a different floor. If I fight the chairs too many times, I'm paid back with extra arthritis pain. As for the Buddhist side of things, I've been admiring Buddhism from a distance for the past year or so. Having distanced myself from monotheistic religions, I find it easy to respect a religion that doesn't focus on a supernatural being, that embraces science, and that grows and changes with the times. That said, I'm not going to be taking up daily meditation practices any time soon. Although, I may read up more on the subject. I found it valuable to muse over the fact that much of our suffering comes not from the physical symptoms of our illnesses, but from how we mentally react to the situation we find ourselves in. We suffer less when we give up the expectations of who we should be, and who we used to be. While I may pick a more formal metta at some point, I was delighted to find a new meaning and a new depth to a song I already loved. The band had hinted at Buddhist influences in the past, but this was the first time they jumped out at me. Beyond the four sublime states, I also resounded with the tonglen practice (pg 97). Instead of breathing in peaceful thoughts and images and breathing out mental and physical suffering, you are supposed to do the opposite. We breathe in the suffering of the world and breathe out whatever kindness, serenity, and compassion we have to give. I can't find the exact spot in the book, so forgive me if I muddle this one a bit, but I also resounded with a passage where Toni spoke of lying on the bed and watching the world go by outside her window. And that not only had she found empathy for all those who were sick, but she found a new empathy for those doing the more thankless jobs that keep this country running. Since I've been disabled, I too find myself more empathetic with many of the less fortunate demographics: the disabled, the elderly, the poor, the maligned and marginalized. It also gave me a real appreciation for the federal safety net. I used to see those who cheated the system. Now I see those who couldn't cope without that hand up. The Republican party, who want to dismantle the federal safety net, has permanently lost my vote.